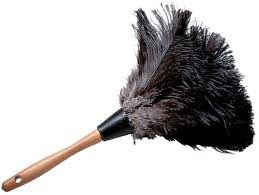 An ostrich feather duster is a great, and functional way to add some fun and style to dusting. This tool is essential when cleaning electronics because dusters made of ostrich feathers do not rely on static electricity to attract dust; rather the dust collects on the microscopic barbs on the feathers. Synthetic dusters rely on static electricity to collect dust so they can potentially damage electronics. In addition, the soft flexible feathers of these dusters easily remove dust from delicate collectible figurines and knickknacks with little to no risk of damage to these valued heirlooms. These dusters are made from ostrich feathers, which the manufacturer selects for quality, attached to a wooden dowel by wire. The length of the dowel typically ranges from 14 to 32 inches. These materials are biodegradable making these dusters very eco-friendly.Some ostrich feather dusters have a casing in which to retract the feathers. This feature protects the feathers thus prolonging the usefulness of the duster. There is a wide variety of ostrich feather dusters from which to choose. Black ostrich feather dusters are made of feathers from the male ostrich. These fine and soft feathers are used in high quality dusters. Floss ostrich feather dusters are made from the downy feathers from the underside of the wing of the bird. These are the most expensive top of the line feather dusters. 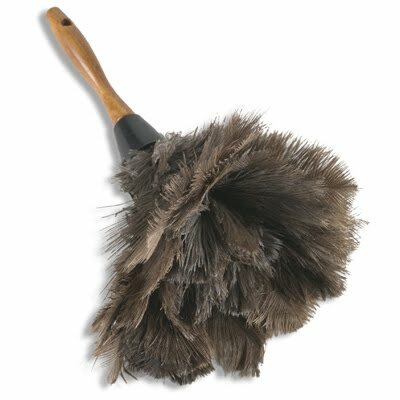 Some less expensive dusters are made from grey ostrich feathers; these are the type most commonly found in grocery stores.